Unlike regular paychecks, bonuses are taxed at a different rate. If you understand how they’re taxed you can take advantage of a number of strategies to reduce taxes and access your money sooner! Written by Adam on September 24, 2018. Updated April 23, 2019. 15 min read. Interactive, Taxes. 4 comments. I care a lot about lowering my taxes, so when I started receiving bonuses from work I was a little confused as to how they were taxed. It didn’t seem to match up with what I expected. This led me down a bit of a research rabbit hole to find out why! What I learned was bonuses are taxed at a standard 25% federal rate, with other taxes added on as well. This led me into a bit of digging – can I reduce these taxes in some way? The biggest factor in taxes will be how your bonus is paid out. The vast majority of bonuses are straight cash, but that’s not always the case. 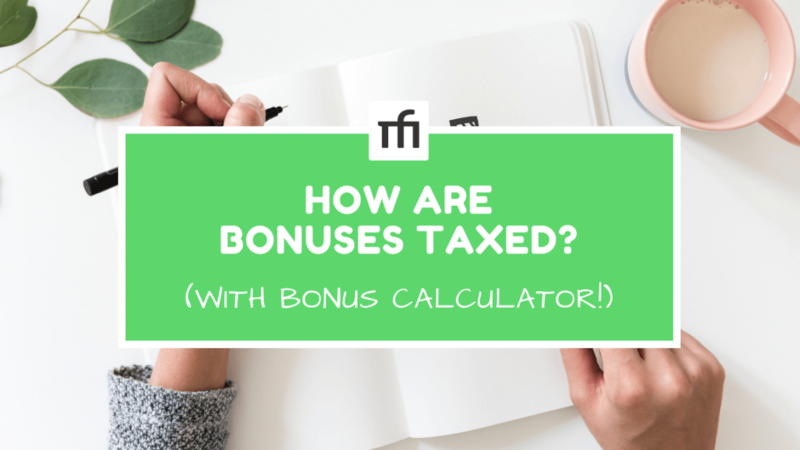 In this post, I’ll go over a few different ways you may receive a bonus and how taxes are handled for each. Bonuses are taxed at a 25% federal rate. That’s the tl;dr of this article, but not the whole story. I’d consider that the minimum amount you’ll be taxed for a bonus. If you live in a place with state tax, that will likely be withheld in addition of that. In Utah, for example, employers my tack on additional ~4% withholding for taxes. On top of that, you’ll likely pay 1.45% in Medicare tax and 6.2% in social security tax. The total tax ends up being around 32%-36% for bonuses. Ok, let’s look at some numbers. Say you received a $10,000 bonus – how would you calculate how much you get to keep? The total tax works out to $3,665 or an effective tax rate of 36.6%! If you’re in a state without income tax, you’d still be paying around $3,265 or 32.6% tax. If your bonus is over $1 million then the federal tax withholding shoots up to 39.6% for anything above $1m with an effective tax rate over 50%. Keep in mind, this is just what’s withheld from your paycheck. If your actual tax rate at the end of the year ends up being lower than 25%, then you’ll get money back when you file your taxes. I personally like to keep my tax bill as close to $0 as possible – meaning that I’m not loaning money to the government. Is there anything we can do to lower this? Turns out there is. If you have a 401k from your employer that allows deposits from a bonus, this can be a great way to use it – especially if you’ll be in a lower tax bracket than 25%. Think about it this way: let’s say your overall federal tax rate at the end of the year is 12%, meaning your adjusted gross income is under $77,400 (jointly)/$38,700. That means you’re overpaying taxes by 13% and getting the overage back when you do your taxes. On the $10,000 example above, that means you’re loaning the government $1,300! What if instead, you were able to put that $1,300 in the stock market for a year? If you contributed it to a 401k you’d get just that. This is especially useful if your bonuses are paid out near the beginning of the year. Rather than giving the government a $1,300 loan until later, that money could be invested in the stock market. Alternatively, you could also adjust the amount of taxes withheld on your W-4. This won’t impact the taxes withheld on a bonus, but it will affect your withholdings for regular paychecks. If done right, this can help balance your taxes, allowing for less money back at the end of the year. For most people I talk to, they think if you’re getting money back at the end of the year it feels like it’s another bonus. When I get money back at the end of the year, I get annoyed! It means that I loaned money to the government and didn’t have a chance to invest those funds throughout the year. By changing the number of allowances, or even the specific amount withheld, it’s possible to get this loan close to $0. The IRS has a very handy IRS Withholding Calculator which can be used to see just how much tax you should expect to pay. After receiving a bonus, you could head over here, put in all of your numbers for the year and see if there’s a way to lower your taxes for the rest of the year! This is an area to approach with some caution though. If you overcorrect and withhold too little then you’ll be on the hook once tax time roles around. There is an option to pay $0 on a bonus, or your paycheck, by adjusting your federal withholding and setting your taxes to “exempt”. You can do this by filling out a W-4 form with your company and putting “exempt” for field number 7. What Does Exempt Mean on W4? “Under penalties of perjury”? eek, those are strong words. From the tax professionals and others I’ve talked to about this, it’s OK if you owed some money on your taxes – so long as you were within 10% of your target taxes. For example, if your target taxes for the year were $25k and you paid $22,500, then you technically underpaid your taxes and owed some at the end of the year. 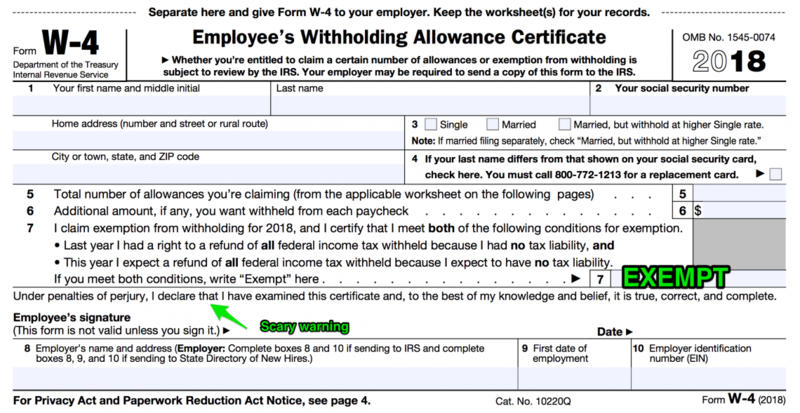 According to the above, you wouldn’t be able to claim exempt on your W4 since you owed money in taxes the previous year. Be aware: if you do fill this out incorrectly, you could be fined up to $500 or worse. If you’re wondering if you should file exempt or not, I’d recommend checking your tax professional. Although I’ve heard there is a 10% buffer, that advice does contradict the wording on this form, so I’d do that at your own peril. If you got money back last time you filed your federal taxes, then I have good news for you! You can claim exempt on your W4. If you do decide to switch this and pay no taxes for a while, just be sure you switch back. I’d recommend switching only for the bonus then immediately switching back for your usual paychecks. This one is the easiest to explain. Restricted stock units (RSUs) are stock issued by an employer through a vesting plan. These won’t usually be a “bonus” per se, but they are given as an incentive to increase the overall compensation for an employee. These are typically considered a “raise” rather than “bonus”. The stock is distributed to the employee based on some combination of time, performance or milestones (depending on the deal of the grant). The most common form is a basic vesting plan, where (for example) the entire RSU package vests over 5 years. Every year you receive 1/5 of the total package, or perhaps every quarter you receive 1/20 of it. The tricky part is that once RSUs vest, they’re taxed with their fair market value – whether you sell them or not. If you work at a publicly traded company and you can sell them immediately, then this isn’t a problem. In that case, you can sell them all immediately, or sell part of them to cover taxes. But what if you work at a privately traded company? This has been a major issue in the tech world for years. Companies that aren’t public issue options to employees, those options vest, then the employees are on the line for taxes based on the valuation of a private company! They can’t sell those shares on the open market, so their only choice is to sell on a secondary one or not buy the options. There are plenty of horror stories of this exact thing happening. Imagine you’re working at Uber a few years ago. You get in early and manage to negotiate a chance to buy options equal to 0.4% of the total company after 4 years of service (or 0.1% a year). As long as you’re an employee, you have the chance to buy these options. Since this is an option, you could wait for 5 years or 10 years then exercise them and be locked in. But what if you leave Uber? Maybe the toxic masculinity is getting to you want to jump ship after 2 years. Let’s say you exercise your options and buy 0.2% of the company for peanuts (maybe it costs $200 to exercise your options). What taxes do you pay on that? Turns out it’s a lot. If Uber is worth $50 billion, then your 0.2% stake is worth a whopping $10 million! You’re rich! Well, not quite. First, you have to pay taxes on $10 million. This would be taxed as ordinary income, which means I hope you have $4-$5 million laying around (depending if you’re paying state taxes or not). Oh, you don’t have $4 million? Hmm, you may not be able to cash out your options at all then – unless there happens to be a secondary market you’re able to sell your shares on before the end of the year. Chances are that secondary market isn’t going to value the company at $50 billion though – maybe shares there trade at $25 million. Now, instead of selling your shares for $10 million, you sell them for $5 million and pay $4 million in taxes. This is a very real scenario that many tech professionals face (it’s unfortunate, but let’s not cry too much for them). Mark Cuban and many others have been attempting to change the language on this situation so that taxes on options for privately held companies aren’t paid out until you actually sell the stock – and would be based off that amount. In that case, they’d paid capital gains tax on $5 million – or about $2.3 million. That’s still a pretty serious tax bill, but at least it’s not an effective tax rate of 80%+ with the risk of losing money. When I hear the term “golden handcuffs” this is the situation I think of. Imagine actually working at Uber, through all of the bad press, and needing to make the choice between leaving and millions of dollars in stock if you waited for them to go public (if that happens). Not an enviable position. This is a common one at a lot of companies to reward employees. A lot of places give out holiday gifts to employees or gift cards on birthdays. Over the past few years, we’ve managed to rake in an Alexa, a GoPro and a Cotopaxi hiking backpack you see in most of my photos (just to name a few). These have a value, that’s not a question – but should I be worried about paying taxes on them? Turns out its kind of complicated. If your company is giving you a gift, you probably don’t have to worry. If you’re a company giving a gift, then things are far more complicated. Businesses are only allowed to give gifts to employees if they count as a de minimis fringe benefit. So what qualifies as a “de minimis fringe benefit”? Cannot be cash, cash equivalent, vacation, meals, lodging, theater or sports tickets, or securities. Office snacks, coffee, soda, candy. Use of office equipment like printers, faxes, scanners or phone. Achievement awards are given to call out great performance. I really like the achievement award one. In our leadership team at Code School, we had the ability to give achievement awards to people on the team whenever we wanted. When I remembered this was great, but unfortunately, this meant that it was often forgotten for periods of time. Something that is considered a bonus (and therefore taxable income) is if your employer provides meals for everyone each day. I’m curious to hear how this is handled at startups and other places from a tax perspective. If you work at a place that does provide meals on a daily basis through a cafeteria for “free” – is that taxed in some way? Going on a team event to Medieval Times after launching a Medievally themed course. 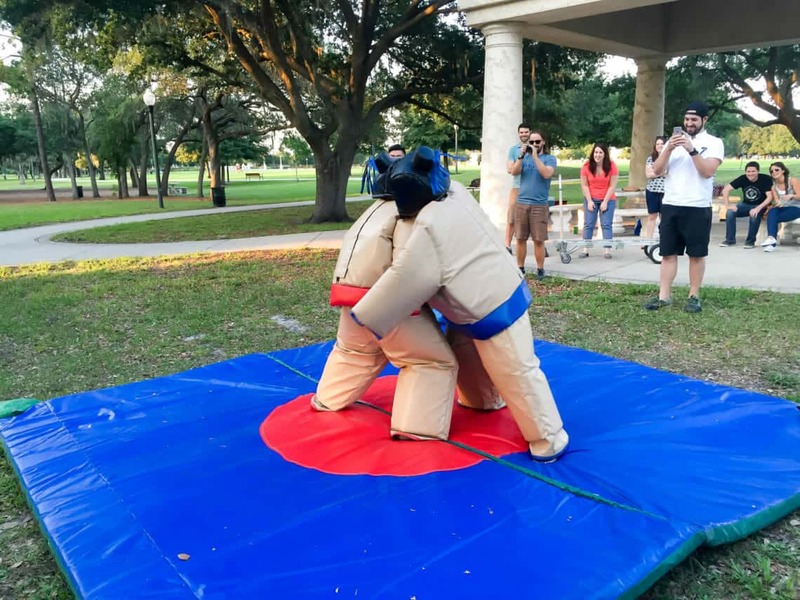 Having a sumo wrestling picnic to celebrate a luchador themed course release. Company events are a great way to spark a little fun when done right – and without the same tax implications. Since the company gets to deduct those events rather than pay you $0.65 on the dollar for them, some may be more inclined to go this route if you recommend it. If you’re receiving a bonus and hoping to use it for something fun, then good luck! If you’re curious about investing it, I’d recommend checking out my free Minimal Investor Course. > Keep in mind, this is just what’s withheld from your paycheck. Although 25% is about were my tax bracket is now. Excellent article–it’s always been a mystery to me, too! Quick question–if one is making over $128,400 does the Social Security tax on the bonus still apply? Thanks! When I processed payroll for a company through Paychex, it always calculated bonuses as if you were going to get that times the number of pay periods in a year. So if you were paid biweekly and got a 10k bonus, Paychex calculated the tax as if you were going to make 260k for the year. If you are single, that would put you in the 35% bracket. The employer (or employee) could change that though and tax it at a different rate. It isn’t a requirement that bonuses are taxed higher….that is how the payroll software calculates it. Ohh, that’s interesting Brandy – and makes complete sense looking at the bonus in isolation. Good to know!